University staff have suspended strikes which were set to hit summer exams after agreeing to fresh pension plans. Planned changes to staff pensions prompted 14 days of strike action at 64 universities in February and March, and more strikes were planned. University employers withdrew plans which the University and College Union (UCU) said would have left members £10,000 a year worse off in retirement. Both sides agreed a joint expert panel to re-evaluate the pension scheme. UCU members backed the deal by two to one. The dispute started after employers’ group Universities UK (UUK) said it planned to remove the guaranteed “defined benefit” pension for members of the Universities Superannuation Scheme (USS). Employers pointed to a large deficit ahead in the pensions scheme, but the scale of this was queried by academics. As part of the agreement, employers said they would not return to the original proposals. 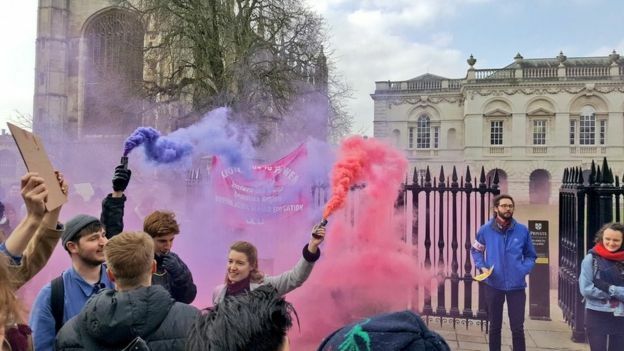 A spokesman for UUK said: “The decision by UCU members to support the creation of a Joint Expert Panel means that strike action is immediately suspended. “This gives students important reassurance that they won’t be affected by further disruption during their summer study and exam period. “Reviewing the methodology and assumptions in the current valuation will build confidence and trust and increase transparency in the valuation process. Sally Hunt, general secretary of the UCU, said the union had come a very long way since January when it seemed that the employers’ proposals for a defined contribution pension were to be imposed.